At the end of February 2016, my portfolio stood at $104,962.94 across all my accounts combined. Comparing to my portfolio balance of $101,322.63 at the end of January 2016, this represents an increase of $3,640.31 for the month of February which represents a 3.59% increase for the month. New investments accounted for $3,136.20 thus giving a net increase of $504.11 that represents a 0.49% increase for the month. I continued my weekly sharebuilder purchases in February. I also purchased SCHD with my proceeds from BAX and BXLT sale. At the end of January 2016, my portfolio stood at $101,322.63 across all my accounts combined. Comparing to my portfolio balance of $104,606.24 at the end of December 2015, this represents a decrease of $3,283.61 for the month of January which represents a 3.14% decrease for the month. New investments accounted for net negative of $173.33, due to the BAX & BXLT sale, thereby giving a net portfolio decrease of $3,456.94 or 3.30% for the month. This decline follows declines November and December. I continued my weekly sharebuilder purchases in December. I also had my Scottrade FRIP purchases. I also sold my stake in BAX and BXLT as mentioned above. At the end of December 2015, my portfolio stood at $104,606.24 across all my accounts combined. Comparing to my portfolio balance of $106,069.99 at the end of November 2015 , this represents a decrease of $1,463.75 for the month of December which represents a 1.37% decrease for the month. New investments accounted for $1,500.00, thereby giving a net portfolio decrease of $2,963.75 or 2.79% for the month. This decline follows declines November. I continued my weekly sharebuilder purchases in December. I did not have any other purchases in the month. At the end of November 2015, my portfolio stood at $106,069.99 across all my accounts combined. Comparing to my portfolio balance of $106,436.79 at the end of October 2015, this represents a decrease of $366.80 for the month of November which represents a 0.34% decrease for the month. New investments accounted for $1,200.00, thereby giving a net portfolio decrease of $1,566.80 or 1.47% for the month. This decline follows a reasonable increase in October. I continued my weekly sharebuilder purchases in November. I did not have any other purchases in the month. At the end of October 2015, my portfolio stood at $$106,436.79 across all my accounts combined. Comparing to my portfolio balance of $97,787.80 at the end of September 2015, this represents an increase of $8,648.99 for the month of October which represents a 8.84% increase for the month. New investments accounted for $1,869.37, thereby giving a net portfolio increase of $6,779.62 or 6.93% for the month. After two months of declines, the market and the portfolio increased in October. After being short of the $100K milestone for a few months, I crossed it this month. 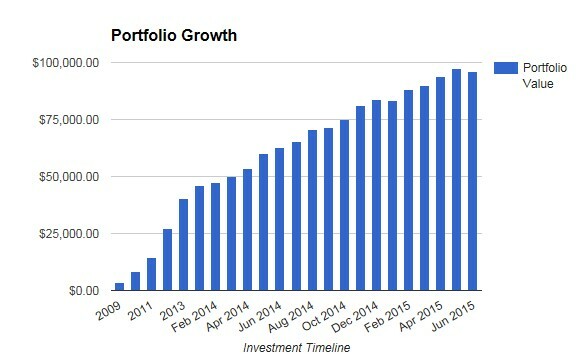 Just a couple of years ago, I would not even have imagined having over $100,000 invested in the market. Looking back, it is definitely a great achievement and I am really satisfied about it. I continued my weekly sharebuilder purchases in October. I also had my quarterly Scottrade FRIP purchase. I did not have any other purchases in the month. At the end of September 2015, my portfolio stood at $97,787.80 across all my accounts combined. Comparing to my portfolio balance of $98,190.40 at the end of August 2015, this represents a decrease of $402.60 for the month of September which represents a 0.41% decrease for the month. I am still shy of the $100K mark again. Been close to it for few months now in spite of continued new investments. I continued my weekly sharebuilder purchases in September. I did not have any other purchases in the month. 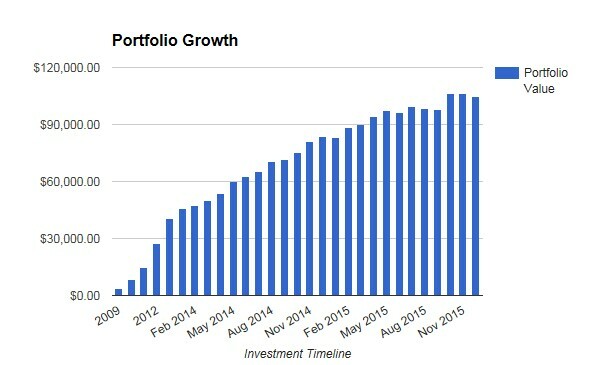 At the end of August 2015, my portfolio stood at $98,190.40 across all my accounts combined. Comparing to my portfolio balance of $99,295.14 at the end of July 2015, this represents a decrease of $1,104.74 for the month of August which represents a 1.11% decrease for the month. At the end of July 2015, my portfolio stood at $99,295.14 across all my accounts combined. Comparing to my portfolio balance of $96,069.37 at the end of June 2015, this represents an increase of $3,225.77 for the month of June which represents a 3.35% increase for the month. New investments accounted for $1,863.28, thereby giving a net portfolio increase of $1,362.49 or 1.41% for the month. I continued my weekly sharebuilder purchases in June. I also made my quarterly Scottrade FRIP purchases this month. 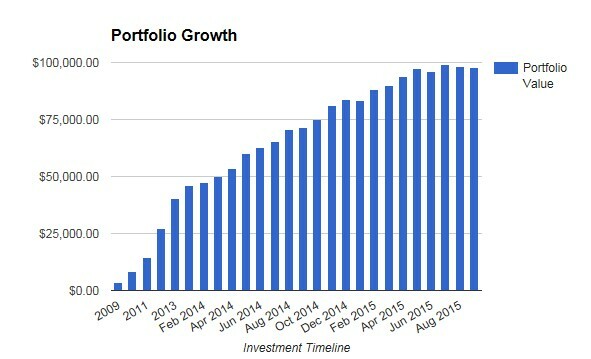 Here is a graph showing the growth of my portfolio since 2009. As always, it is satisfying to see the graphs going higher each month/year. It reinforces the fact that I am making progress towards my goals. At the end of June 2015, my portfolio stood at $96,069.37 across all my accounts combined. Comparing to my portfolio balance of $97,412.10 at the end of May 2015, this represents a decrease of $1,342.73 for the month of May which represents a 1.37% decrease for the month. New investments accounted for $1,500.00, thereby giving a net portfolio decrease of $2,842.73 or 0.38% for the month. I continued my weekly sharebuilder purchases in May. I did not make any other purchases. 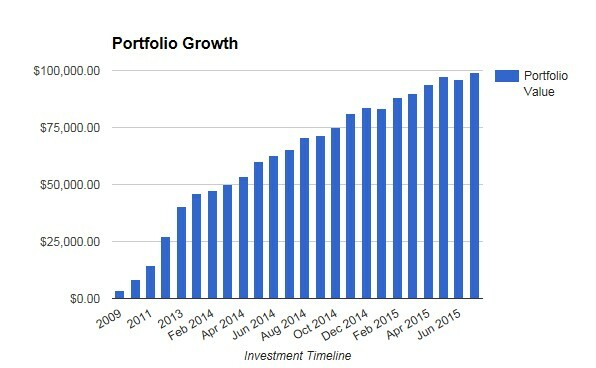 This follows over $3,700 of new investments in May.